Reminder -- if you are interested in the Spartan Race, here is a 15% discount code for you. There is going to be a Spartan Sprint at Citi Field on April 12 (MLB-related tie-in here!) I am hoping to compete in it myself! Please check out the video below to get pumped up over it. Recently, Squawker Jon and I were invited to check out “Bronx Bombers” on Broadway. We did just that, and enjoyed the play (although I did more than Jon; he is still waiting for a Broadway show to celebrate the Mets, though I did point out to him that a revival of "Les Miserables" opens next month.) Here are my thoughts on "Bronx Bombers." Spoiler alert if you want to be totally surprised before seeing the show. That’s even though I thought that the play should have done more to explore Jackson’s side of the story when it came to Martin, given that race had a lot to do with Martin’s animosity towards him. I wrote in notes then that “the show is too kind to Martin, and too rough to Jackson.” Despite that, the writing was mostly pretty good in this part, and the acting, particularly by Bill Dawes as Thurman Munson, was very good. We were a little confused at the beginning of the previous play, though, as the actor playing Yogi looked more like Martin than Berra, and for the first 10 minutes, we thought we were watching Martin! But when we saw the show’s dreamlike dinner party in the off-Broadway production, we thought it was “bizarre,” as I wrote in notes I took after the first show, made no sense, and took away from the show’s fairly strong first act. 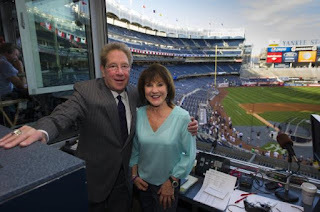 That dinner party is still in the play, with Yankee legends old and new, but fortunately, it makes a bit more sense in the retooled show, with better writing and better acting – Peter Scolari is a standout as Yogi Berra, and Tracy Shayne, his real-life wife, is excellent as his wife Carmen. There are lots of Yogi-isms throughout the play – more than I remember in the original version – and most of them draw knowing laughter from the audience. The first act is tighter now and makes you understand and empathize with each character. Reggie, played by Francois Battiste, (who also plays Elston Howard at the dinner party), now points out the racial issues he was facing as an outspoken black man in the 1970s in the way that is illuminating without being pedantic. Billy, played by Keith Nobbs, is a well-acted mess in western wear, although Nobbs doesn’t quite look old enough to play Martin. The main four players in this Bronx Zoo drama are very entertaining to watch. As for the second half of the play, the dinner party works better than when we saw it in previews. Dawes, who plays Munson in the first act, is outstanding as Mickey Mantle in the second act, looking, sounding and acting like Mantle. He spars with Joe DiMaggio, played by Chris Henry Coffey. Their characters are the must-watch part of the party. Christopher Jackson plays Derek Jeter at the party, and while he doesn’t look all that much like Jeter, he does sound like him, and he inhabits the role more than he did when he saw him last fall. There were two issues that I had with both versions of the play. The first is that if you are going to have Yogi as the central character, you have to talk about his 14-year estrangement from the Yankees. It is one of the more interesting things about him – he is one of the few people to stick it to George Steinbrenner. The second is that Steinbrenner should have been in the play. He is the kind of larger-than-life dramatic character you would want to have in the show. After the play was over, Jon and I stuck around to see a post-play chat with Scolari, Shayne, and Fran Kirmser and Tony Ponturo, the producers of the play. They explained the reasoning behind both these issues, but I still think it would have been a stronger play with those elements in there. But that's quibbling. When an audience member asked if they were concerned about having the actors look like the players, the producers and actors said they put more of a priority on finding bits of behavior to create the characters of the players. If you want to walk down Yankee memory lane on Broadway, you should check out “Bronx Bombers.” While it's not a home run, it's a solid line drive double. “If somebody told me I was a dog," Long said here Sunday, “I’d have to fix that. When you choose not to, you leave yourself open to taking heat, and that’s your fault. For whatever reason, Robbie chose not to." Sure, Long was complimentary at times about Cano when talking to John Harper, but there were an awful lot of negative comments in there about the Yankees' best player last year. And Long never acknowledges a pretty good reason for Cano not to play 100% at all times -- that he has been able to stay healthy throughout his career and play nearly every single game. Cano only missed 14 games since 2006 -- that should have been mentioned in the article. Anyhow, I had to wonder why Kevin Long was talking about Cano to such an extent anyway. What was the purpose? If Long thought this was so important for Cano to hustle, and he didn't do it, that reflects as badly on the hitting coach as it does on the second baseman. It also seems like bad form to me for him to trash Cano after he went elsewhere. If he had stayed on the Yankees, would Long be publicly flapping his gums on the flaws in Cano's game? Maybe Long ought to pay more attention to his day job instead of being the Yankees' henchman.